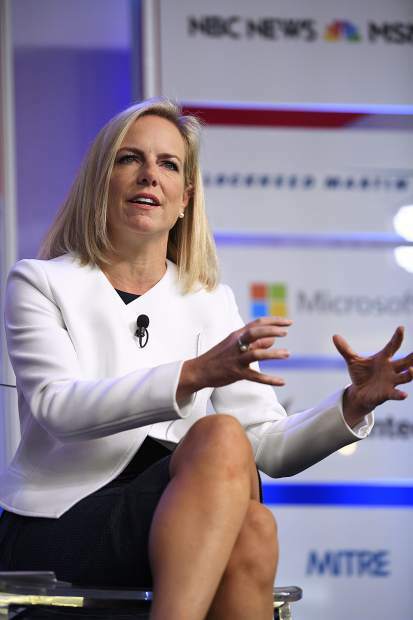 Director of Homeland Security Kirstjen Nielsen spoke Thursday morning at the Aspen Security Forum and address immigration issues at the U.S.-Mexico border and Russian interference in the 2016 election. ASPEN — Saying repeatedly that this country’s immigration system and the laws that dictate separating children from their parents at the border are fundamentally flawed, the head of the Department of Homeland Security said Thursday, July 19, in Aspen that she will do her best to meet a court-set deadline to reunite families. Nielsen spoke for an hour with NBC News’ Peter Alexander in the Doerr Hosier Center as part of the Aspen Security Forum. Thursday, July 26, is the deadline set by a federal judge for the government to reunite an estimated 2,500 children with their parents who illegally crossed the U.S. border. Most of those families were fleeing violence in countries including Honduras, El Salvador and Guatemala and were separated at the U.S.-Mexico border as part of the Trump administration’s zero-tolerance policy on immigration. Nielsen said the problem with the immigration system is that the ideals and empirical truths that Americans have cannot be true at the same time. “Kids should be with their parents, countries should be able to protect borders, governments should be able to protect communities,” she said, adding that it is the job of Congress to fix the system with new laws. Alexander asked Nielsen if when she visits the detention centers in Texas and other facilities at the border, she questions as a human being what the country is doing to these children. Nielsen said, in so many words, that her hands are tied. “We have Congress telling the executive branch, ‘Don’t enforce the laws we pass. We don’t have courage to fix them.’ We have the judicial branch, who is neither operational nor a legislative body, saying, ‘This is how we want you to enforce the law’ in a very tactical way, thereby making a law. How it should work is Congress should make the laws, the law enforcement bodies should enforce the laws and the judicial branch should interpret them. Nielsen has met with leaders of Guatemala and Mexico to discuss strategy to stabilize their countries so their citizens aren’t forced to flee. But more importantly, she is working with international communities to provide asylum at various points in immigrants’ long journey to the United States. She said that since President Donald Trump signed an executive order last month, DHS is no longer separating families at illegal ports of entry — unless the agency cannot guarantee that a parent or adult is the child’s legal guardian; if the child is in clear danger; or if the accompanying adult has to go to a criminal detention center. Twenty percent of the adults who have accompanied children younger than 5 years old at the border were determined not be fit to be reunited — the vast majority were smugglers or traffickers, kidnappers, murderers, child abusers and exploiters, Nielsen said.